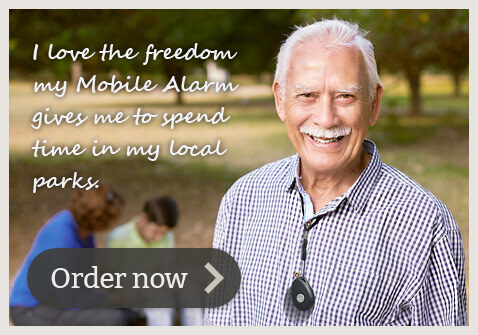 The LiveLife Mobile Alarm will provide you and other family members’ peace of mind that when you are home or outdoors that help is just a press of a button away. When you press the SOS help button it sends a text message with your position on Google Maps to up to 5 emergency contacts and then starts calling each of the emergency contacts one by one. During the setup you can choose to have both calls and text messages during an emergency or only text messages. We have texts and calls set up as default. Yes. Because it works like a mobile phone it needs to be connected to the mobile phone network to work. As part of your purchase we normally install a SIM card that will pick the best available signal from either a Bell, Telus, Rogers, MTS, Tbaytel or Sasktel mobile tower in your location. We’ll check your address on coverage maps to double check that the mobile alarm will work well in your area. The mobile alarm comes with one year’s worth of unlimited emergency voice calls and emergency texts. As you move around Canada the mobile alarm will always use the strongest signal from the closest Bell, Telus, Rogers, BellMTS, Tbaytel or Sasktel mobile network. No. Most customers like us to install our unique SIM card which uses the best available signal from the closest Bell, Telus, Rogers, MTS, Tbaytel or Sasktel mobile towers. This option includes unlimited emergency voice calls and texts for a whole year. After the first year it will cost $45 for unlimited emergency calls and texts for year 2. Another great feature about this option is there’s no reason to worry that credit will run out when you need it most and there’s no need to check websites to check how many minutes you have remaining. There is no 911 monthly fee either. Family and friends can call the Mobile Alert whenever they like and for as long as they like at no cost to the wearer of the Mobile Alarm. We also have a prepaid SIM card which is self managed. The included prepaid credit amount should easily be enough to last for up to 365 days if the Mobile Alarm is used primarily as a medical alert device and GPS location device. Each emergency text only costs 10 cents and each phone call costs 30 cents per minute. We include a $10 sim card and $25 credit valid for the first year all set up and ready to go. Remember the $1.25 per month government regulatory 911 fee will be deducted each month from your account if you choose this option. The pendant is a perfect size. It is 61mm tall x 42mm wide x 16mm tall. It weighs the same as four quarters. The pendant has a soft, rubber-like outer skin which is easy to grip. It weighs only 35 grams, the same as four quarters. You can put it on your favorite chain if you like or even place it on a key ring. You can even attach it to your belt. The SOS help button is recessed making it hard to press accidentally. To activate the help calling sequence the button must be pressed for three seconds. It will vibrate to let you know it has been pressed for long enough and then it will “beep” loudly for 20 seconds before activating. Click the SOS button within this time if it was an accidental activation. As part of the setup we will install a Sim card for you that picks the best available mobile signal out of the closest Bell, Telus, Rogers, MTS, Tbaytel or Sasktel mobile tower, depending on where you are at any given time in Canada. It includes the first years worth of emergency voice calls and texts and there is no need to keep an eye on remaining credit. We will supply you with the mobile phone number assigned to your pendant and that number will be clearly marked on your paperwork that comes with your Mobile Alarm. Some people prefer to use a prepaid Sim card. If this is you then we’ll set that up for you and include $25 worth of calls and texts for the first year. We’ll supply you with an account username and password so you can self manage prepaid credit as required. If you choose to use our custom “Genius” Sim card that comes with unlimited emergency calls and texts for the first year, then about 11 months after your order we’ll send you an email and/or letter reminding you to “top up” with another $45 to cover unlimited emergency calls and texts for Year 2. If you choose to use the prepaid sim card option then you can logon to your prepaid credit account at any time and check your credit or call a toll free number provided in your package paperwork to check on your remaining credit before deciding if you need to top it up. -Activation of one years worth of unlimited emergency voice calls and texts. -Pre-programming of up to five emergency contacts and the help text message. The cost of setup and delivery is included in the price. Your Mobile Alarm will be sent via Canada Express Post. LiveLife Alarms uses the Stripe Payment Gateway for its online credit card transactions. Stripe processes online credit card transactions for thousands of Canadian merchants, providing a safe and secure means of collecting payments via the Internet. All online credit card transactions performed on this site using Stripe are secured payments. Your Mobile Alarm will be sent to you via Canada Post ‘Express Post’. How long it takes to arrive will depend on your delivery location. Once we have shipped it the order will be able to be tracked the delivery via Canada Post. Before we setup and deliver your Mobile Alarm we will do a coverage check of the Bell, Telus, Rogers, MTS, Tbaytel and Sasktel Mobile Network at the address of the user of the pendant. If the coverage map indicates inadequate coverage at that location we will advise you on other options. Yes. Just call us on 1 877 801 7172 and we can figure out a payment plan that works for you. There is a one-time payment for the LiveLife mobile alert. Other than that the only ongoing costs are $45 every 365 days (although your alarm comes loaded with unlimited emergency voice calls and texts for the first year) which pays for any calls the mobile alert makes. We like to set this up for you before sending you your mobile alert so you don’t need to worry about it. So after Year 1 your ongoing costs are just $45 a year, which covers unlimited emergency voice calls and texts for the year on the best available mobile tower depending on where you are in Canada at any given time. Furthermore, we offer flexible payment styles. We can figure out a way for you to pay off your LiveLife mobile alert in a way that makes sense to you. Just call us on 1 877 801 7172 to discuss the payment options.